You and your fiance have adventurous spirits. 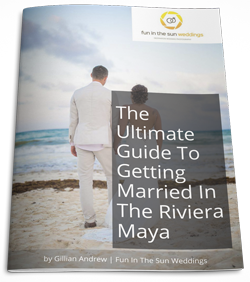 You would like a destination wedding somewhere beautiful, warm and accessible like Cancun, but you don’t fancy the big crowds or tourist trap vibe. You would far prefer to get off the beaten path and get married on a beach where most of your wedding guests have never been, let alone even heard of. You have heard some buzz about this stunning little Caribbean island close to Cancun, called Holbox (Hole-Bosh), and are wondering if maybe it is the right place to plan your beach wedding…..
Have no fear, we are here to help! Here are the 8 things that every couple considering a Holbox wedding should know. It is hard to find the right word to describe Holbox. Yes, ‘Paradise’ is pretty appropriate. But it is more like if Paradise had a baby. A loveable little Paradise baby, intoxicating in the way that only belongs to something so tiny, new and pure. That would be Holbox. You’re going to be aware of this totally unique vibe as soon as you step on the island. All faces sport that dreamy, dazed look of being without a care in the world. Nobody is in a hurry. And you can feel a peaceful energy all around. Holbox is a place where the days will slowly melt away while you dissolve into a putty-like version of your formal self. Bienvenidos. You have just stepped back in time to a place in Mexico who’s authenticity has not been drowned by mass tourism….yet. You can expect your destination wedding on Holbox to have a totally stress-free vibe. And what bride and groom wouldn’t welcome a bit of stress relief around the wedding? Although the island is quickly gaining attention, it’s still a new discovery for most tourists outside of Mexico, and the route from the airport does not reflect the demand yet. You should plan for travel on poorly maintained roads between Cancun and the Holbox ferry, and some potential confusion from transfer companies over the best direction to go from the airport. This is the price you pay to get off the beaten track! 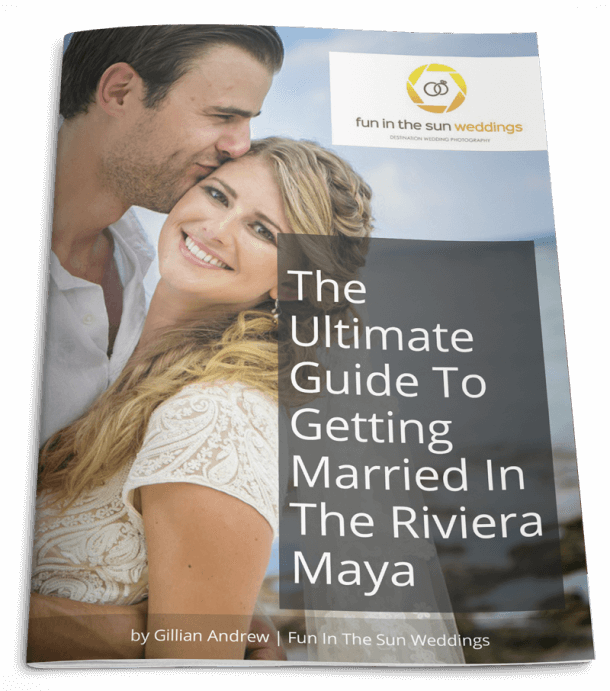 So arrange for comfortable ground transport for yourselves and your wedding guests because it is not unheard of to be driving for more than three hours from Cancun, although it should actually only take approximately half that. Read this for more on how to get to Holbox. Of course, you will want to plan evenings out with your wedding guests, or group activities and excursions. The best part about having a destination wedding is all the quality time you get to spend with family and friends sharing the vacation of a lifetime! So when planning your ladies day out, or rehearsal dinner in town, whatever is on your wedding agenda, know that on this lovely little eco-friendly island, the only motorized vehicles are golf carts. They even use yellow golf carts as taxis. How awesome is that! To facilitate keeping your wedding group of a dozen or more together, consider reserving a bunch of golf carts to use during your stay. Bicycles are another great option too if the tree-hugging approach is more your jam. And if your nearest and dearest are a fit bunch, then grab yourselves some paddle boards to travel from one end of the beach to the other. The water is so beautifully calm that I can’t imagine a nicer way to travel between Happy Hour and the bungalows! There is no big Supermarket on the island, so if you need anything from waterproof mascara to a waterproof camera for your wedding day, it is best to bring it with you. This includes medications, your favorite snacks, champagne or absolutely anything that your wedding coordinator has not already promised to take care of for you. Internet speed can be….well, let’s call it challenging….even in the well-populated centers of Mexico, so when you find yourself on a remote island hours away from Cancun, you should definitely be prepared to disconnect from the outside world! To be clear, I am not saying that there is not any internet because there is. But it is super slow and was only available in public places during our last visit. Clear your desk before taking leave from work, and finish up everything important before arriving on Holbox for a wedding. But hey, you are getting married after all! The emails can wait. Locals have known about Holbox’s special charm for years, but now that it is catching fire elsewhere in the world, great accommodation has become a premium. How is one little island supposed to keep up with its own popularity? We have always recommended that you book your destination wedding early to avoid disappointment, but especially in a place like Holbox. You want your pick of the litter, not the leftovers, for your wedding. Do not procrastinate, because it is the early bird who gets the honeymoon suite! Wedding photos on Holbox won’t disappoint! Want a calm crystal clear turquoise ocean with powder white sand as a backdrop for your nuptials? Check. Want wedding photos that look like you have a whole private beach to yourselves? Check. You can’t imagine how pretty this place is. It feels secluded, untouched and squeaky clean. It is a wedding photographer’s dream! After your wedding, You will never want to leave! If you want an eco-friendly wedding location that will wow your wedding guests and leave them all talking about your amazing off the beaten path destination wedding for years to come, then look no further than Holbox. Mexico. Period. And if you’re looking for the best Holbox wedding photographer to capture your destination wedding in Holbox, Mexico, then contact us today! We are Fun In The Sun Weddings, the best wedding photographers in the Riviera Maya and beyond! Did you get married on Holbox? We would love to hear about it in the comments below! To learn more about Holbox Island, check out Tripadvisor here. Can you help? Do you have any brochure ?